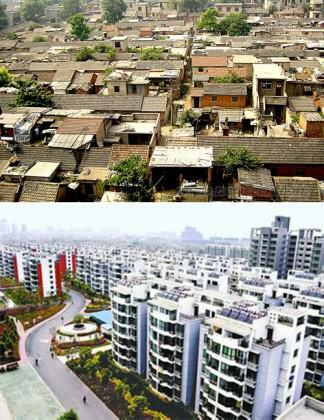 China’s rapid urbanization in the last 30 years has brought about many problems. The country is now facing a huge challenge to balance economic development with environmental conservation and social stability. Sustainable development is in the spotlight: how can we build a better city that can provide a better life for its citizens? The ecocity seems to be one of the solutions. Since the concept of “Eco-Civilization” was advocated by China’s central government in 2007, local governments have responded actively to the appeal. By 2011, 90% of Chinese cities at the prefecture-level and above had proposed ambitious goals to build eco-cities (XIE and ZHOU, 2010). However, in China and throughout the world, the ecocity is still in its preliminary stage, without a mature theoretical basis and systematic exemplary practices. Local governments in China are encouraged to learn by exploring sustainable development models through ecocity construction. Different people hold different opinions on the concept of an ecocity. By now, there has been no globally recognized definition for an ecocity. In China, a representative definition is: an Ecocity is a composite human settlement system combining balanced socio-economic development with healthy ecological objectives to achieve the harmonious coexistence of man and nature. 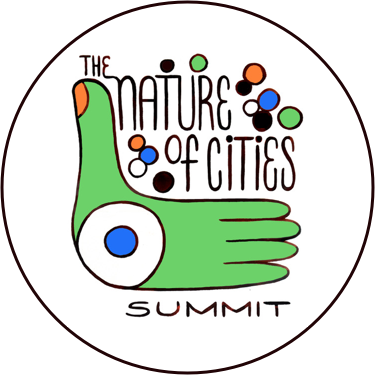 Main development areas • City planning, eco-community, green building, green transportation, eco-infrastructure, energy use, water resource use, waste disposal, eco-industry, digital city, eco-ideology and behavior model, institutional support system. Development stage • The concept of ecocity has been proposed for some 40 years. In the past 10 years, the research of ecocity theory and practice has gradually heated up. In China, the so called “ecocity boom” is around the corner. However, as there is no mature ecocity theory and practice now, everything is still in the exploration stage. Eco-city is more an advocate or idea than a reality. Until now, no city could label itself a globally recognized ecocity. Uncertainty exists in its future development. There are generally two types of ecocity initiatives in China: new ecocity projects (e.g. Sino-Singapore Tianjin, Caofeidian, Beichuan, Chenggong, Yuelai etc. ), and eco-remodeling of existing cities (e.g. Huainan, Tangshan, Shenzhen, Miyun, Anji, etc.). 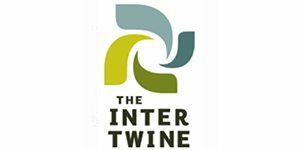 Many of these remodeling projects are implemented in resource-based cities that need urgent ecological renovation. 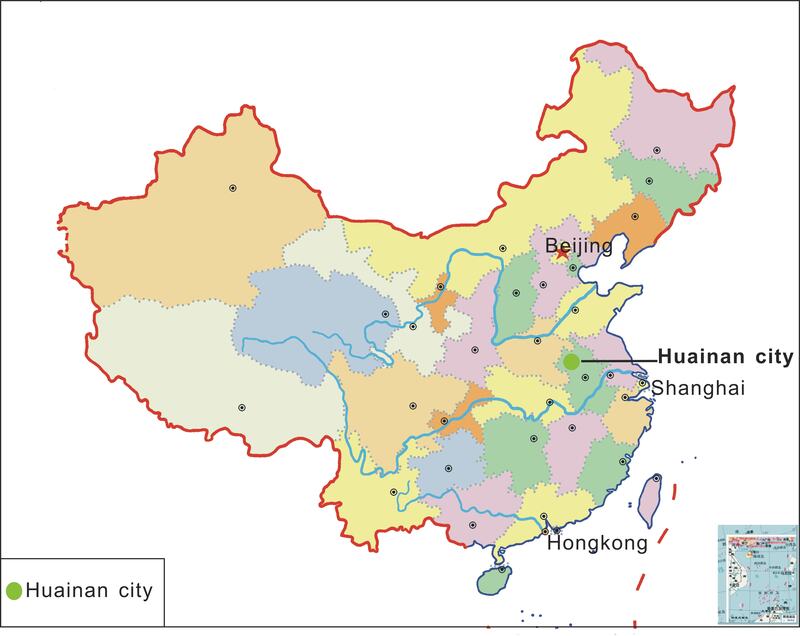 There are 118 resource-based cities in China with a total population of 154 million. Located in central Anhui Province some 980km from Beijing, Huainan is an industrial city and an important Chinese energy producer, with significant coal, electricity generation, and chemical industries. It is one of the largest coal producing areas in China. The estimated coal reserves are 44 billion tons, making up 19% of all the country’s total coal reserves. The city has a population of 2 million an area of 2121 km2. In the last 10 years, Huainan has been striving to develop into an environmentally friendly and resource conserving ecocity. Its development mode was hailed by the central government, and it was selected as one of the best practices for sustainable urban development in China. China has adopted a policy of urban-rural dual structure system since the founding of the Republic in 1949. The system is urban-biased in economic, social and infrastructure development. This has brought about many problems triggered by urban-rural separation and inequality. It creates a serious obstacle for sustainable urban-rural integrated development. 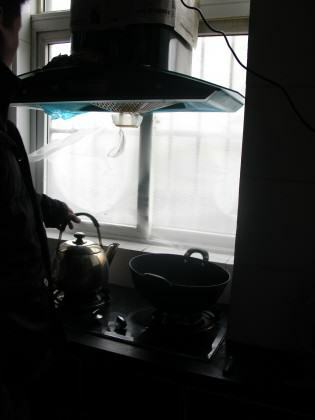 Huainan has taken the lead to change this situation through its “Urban-Rural Integration Plan 2011”. 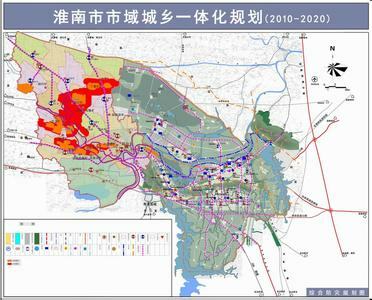 Upholding the idea of an integrated Huainan, the plan features comprehensive treatment of coal subsidence areas; promotes intensive and compact development of urban and rural land, maintains five balances of urban-rural planning, industrial development, infrastructure, public service, employment and social security. Altogether, the plan supports an urban-rural integrated development model of “industry promoting agriculture, city helping town, town helping village and city-town interacting with each other.” There is an ecocity indicator system tailor-made for Huainan, which sets targets and provides an assessment tool for each stage of development. Long-time coal mining results in subsiding land, which in effect destroys the local environment. Main ecological restoration techniques of mining subsidence areas include improvement of soil, re-vegetation and application of soil micro-organisms (LIU and LU, 2009). According to Huainan’s “Eco-city Construction Plan 2005” the local government will by 2020 invest 10 billion RMBuan in ecological restoration, infrastructure and slum reconstruction. An important feature of the Eco-City Construction plan is that ecological renovation goes hand in hand with infrastructure improvement, human habitat environment upgrading and industrial transformation. 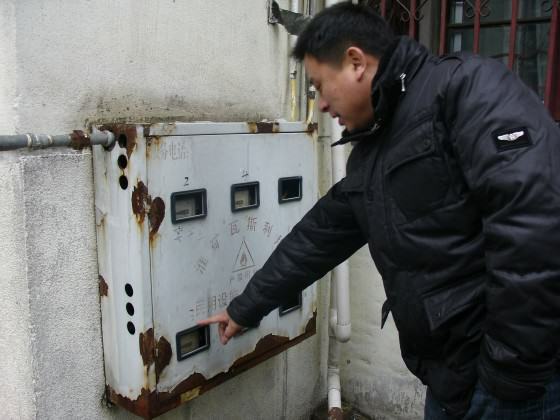 Huainan’s coal mines have been exploited for 500 years and mining subsidence areas exist in many places of the city. In 2007, the city launched an ecological restoration project of the Quanda region, 1,250,000m2 in area and with 250,000 inhabitants. The coal has long been exhausted there and the land was abandoned, leaving a wasteland of mining subsidence areas. In compliance with the topography of the region, the government divided it into four sub-areas for ecological restoration, and reconstructed them with different characteristics. These four sub-areas include reservoirs, wetlands, residential areas and mountains. 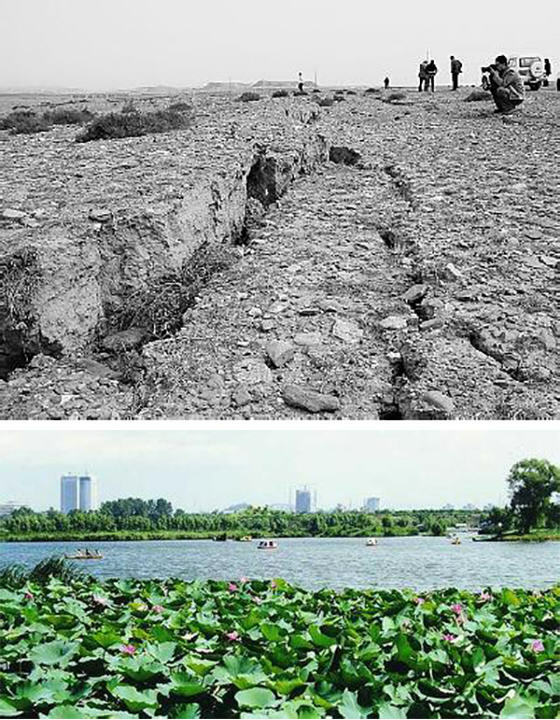 The wetland area centers around the Datong mining subsidence, where the environment is most seriously damaged and in need of urgent remediation (e.g. construction of wetland parks and public facilities, closure and relocation of heavily polluting enterprises, vegetation restoration and landscaping etc). In 2010, with the completion of the restoration project, the Quanda region was revitalized and became a new urban center for living, working, transportation and recreation. Mining subsistence areas, before and after restoration. Coal mines emit gas containing mainly coal mine methane (CMM). It poses the biggest risk to coal mine safety, and it is one of the major greenhouse gas emissions contributing to global warming. However, if the coalmine gas is comprehensively utilized, it can be converted into a source clean energy. Huainan is the forerunner of comprehensive coal mine gas utilization in China. Its coalfield is rich in CMM resources and has large-scale CMM drainage. Huainan Mining Group is in charge of the effort to comprehensively utilize the drained CMM and ventilation air methane as green energy resources. The National Engineering Research Center for Coal Gas Control is established in the city. According to market conditions in the region, the most practical utilization option for CMM is use as household fuel, and secondarily for power generation. The household utilization project mainly uses CMM recovered from the seven permanent gas drainage systems (USEPA and CCMC, 2001). The Huainan mining area is divided into the Panji and Xinxie Blocks, and CMM in these two blocks is supplied to residents in Huainan City through the gas storage and distribution system and pipeline network, serving 100,000 households. In addition, the CMM is used to generate 47,646,000kwh of electricity each year. The CMM recovery method adopted in the Huainan mining area is underground gas drainage. The total CMM drainage was 49.4 Mm3 in 2000 and reached 416 Mm3 in 2010. During coal mine operations, a large amount of mine water is discharged. It not only causes environment pollution to surrounding mining areas, but also wastes a lot of precious natural resources. Comprehensive utilization of mine water is needed for the sustainable development of coalmines. Appropriate utilization of mine water enables us to achieve the multiple goals of economic, social and environmental benefits. 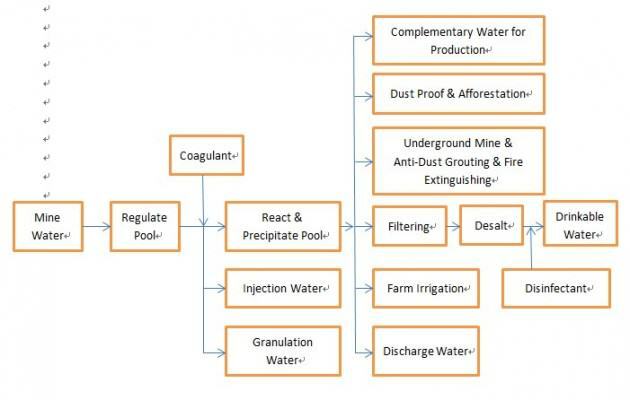 The mine water is classified into five categories according to qualities and characteristics. Different techniques are used to treat each category of water. 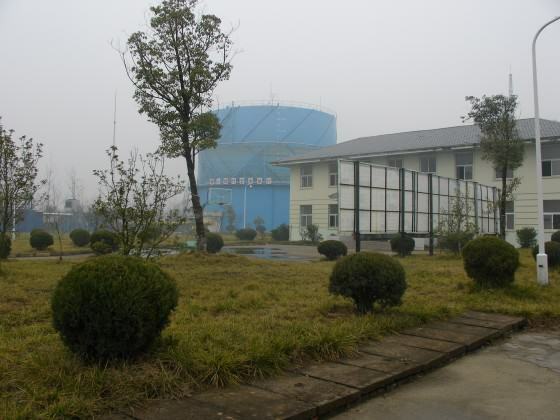 After the treatment, the water is suitable for industrial and domestic use. In 2007, Huainan Mining Group processed 15.1 million m3 of mine water with a utilization rate of 61%, saving 12.8 million RMB a year. Huainan is a coal-dependent city and its leading industries are coal mining, electric power generation and chemicals. To achieve a balanced industrial structure and sustainable development, the restructuring of its industry is necessary. Economic development plans were made and industrial parks were established to encourage economic developments and a diversified industrial structure. Today, apart from coal mining, electricity and chemicals, more and more industries are represented in its economy, including pharmaceuticals, construction, textiles, machinery, electronics, light industry, high technology and cultural and creative industries. Huainan has a long history. It was once the capital city of the state of Chu (one of the major powers in ancient China) during the Warring States period (475BC-221BC) and the city has kept its prosperity ever since. Now, Huainan has many historic sites, like Bagong Mountain where the famous Feishui Battle was fought in 383AD along with the ancient Chu state capital and the tombs of many historical figures. Since 2000, the local government has made plans to boost its tourist industry. Large investments have been made on tourist infrastructure upgrading and service improvement. Income from tourism has increased sharply since 2001. Huainan’s tourist industry is associated with rich cultural activities. Known in China as the birthplace of Tofu, each year Huainan hosts the Chinese Bean-Curd Cultural Festival, which has been held for 19 years. Nowadays, eco-tourism and agri-tourism (agri-tourism includes a wide variety of agriculturally-based activities, such as picking fruit, buying produce direct from a farm, feeding animals and farm stay etc.) are very popular in the city. Moreover, one of Huainan’s industrial ambitions is to develop the animation industry. The local government has invested 6 billion RMB to build an animation industry park in the city. These rising “smokeless” industries have the potential to contribute to the ecological transformation of the industrial structure, and will help to deliver a more balanced form of economic development to Huainan. It is a general consensus that social equality is a prerequisite for ecocity development. Huainan’s local government has worked hard to help underprivileged citizens improve their living conditions. An important component of Huainan’s public welfare program involves slum reconstruction. From 1950s onwards, many shanty towns have established alongside the coal mines to accommodate miners. In the planned economy period (1949-1978), the government focused on production rather than on consumption. Miners’ quality of life was neglected. They lived in slums with primitive conditions and a bad environment, posing a threat to local security and having a negative impact on urban development. In 2003, under the leadership of the local government, Huainan Mining Group launched a campaign to progressively reconstruct slums in the city. The plan called for an investment of 13.9 billion RMB to build a total of 8.7 million m2 affordable housing in the following 10 years, altogether benefiting 250,000 people. In 2007, the 1st batch of residents moved in to the new housing with consummate infrastructure and social amenities. Slum reconstruction has revitalized the local community and is an important function of the city’s sustainable development. Capacity building is one of the most important components of ecocity development. The stakeholders include city decision makers, companies, public service departments, public organizations, social associations, individual households and residents. Huainan focuses its efforts on the establishment of proper government management systems, information dissemination, along with education and training for residents. 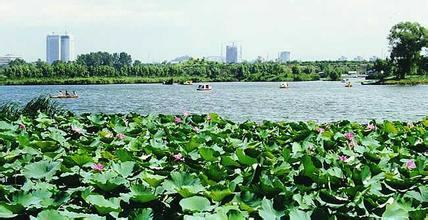 Local laws and regulations were made to promote and guarantee ecocity development in Huainan. These laws include the “Regulation on Environment Protection of the Development and Construction Projects”, “Regulation on the Restoration of Coalmine Subsidence Areas” and “Management Ordinance of the Recycling of Renewable Resources.” Relevant plans were compiled to guide its development, like the “Ecocity Construction Plan 2005”, “Urban-Rural Integration Plan 2011”, “Master Plan for Mineral Resources”, “Public Transit Plan” and “Master Plan for the Tourist Industry.” Enforcement and implementation of these regulations and plans were greatly enhanced by revising the political achievement assessment system for local government officials, effectively moving from a GDP centered system to a more comprehensive assessment of environmental, economic and social balanced development. Better enforcement was also achieved by increasing the public participation in the compiling, implementation and management of the whole planning process. The local government has also worked to expand urban financing channels by exploring new models like PPP, BOT, BT to raise funds for the construction of eco-city infrastructure projects, in addition corporate investment construction and government repurchasing. People’s habits, behavior and life style choices have a deep impact on ecocity development. Dissemination of information, education and training for the public all plays a significant role. Huainan has established a National Education Base for Eco-Civilization, a platform for eco-education. Local government tries to foster an ecocity, eco-community and eco-family culture by organizing training seminars and activities such as “City Car-Free Day” and “Low-Carbon Eco-Family,” thereby publicizing ecocity concepts to residents from all walks of life. 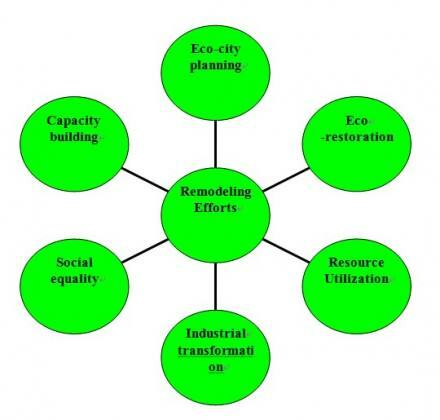 Huainan’s remodeling efforts cover 6 major areas of ecocity development as shown below. Huainan’s experience shows a vivid picture of ecocity remodeling practice in a resource-based city. Through Hainan’s example and Chinese understanding of the definition of an ecocity achieves a balance between the environment, natural resources, industry, and social equity. There is no fixed and unified model for ecocity development. Residents in different cities hold different opinions on what makes an ecocity. However, they tend to agree on some important areas of ecocity development. According to a questionnaire survey conducted in eight Chinese cities of vary size and regions (in total, 788 respondents), the most important factors influencing sustainable urban development are the natural environment, housing, income and employment, transportation, and social security. Ecocity development in resource-based cities involves a lot of aspects. It cannot be conducted in all-round manner, and it can’t reach its final goal in one step. Each city must examine its own individual characteristics, and concentrate their efforts and to make those defining characteristics the highlight of their city. Then cities should spread their relevant experience points to other areas. In other words, be sure to avoid aiming too high beyond one’s reach in an attempt to gain quick success and instant benefits. Ecocity development is not the end product, rather, it is a long-time systematic process towards sustainable urban development. We shouldn’t dwell on the terminology the ecocity, as it is no more than a useful phrase to express people’s aspiration on an ideal city, like the “Garden City” term used over a hundred years ago. What is far more important is to witness the city’s actual progress on the road towards urban sustainability. Acknowledgement: Thanks to Jack Maher (PIA fellow at NRDC) for the English editing. 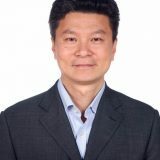 USEPA (2001), Investment Opportunities in Coalmine Methane Projects in Huainan Mining Area, Huainan Mining Group Ltd.
Pengfei is the Deputy Regional Director for East Asia of the C40 Cities Climate Leadership Group. He works with colleagues to build and maintain relationships with cities in the region. He is a Certified Urban Planner.